NAVITEL® releases a major software update for smartphones and tablets running on Android and iOS (iPhone and iPad). 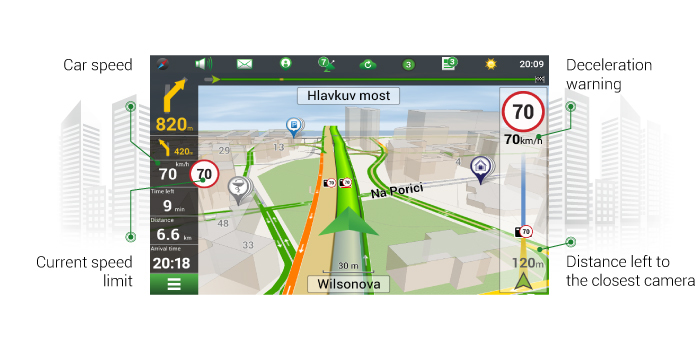 Navitel Navigator 9.10 release includes a large-scale revision of the notification system when the car is approaching speed cameras and various road regulations. In the new version of Navitel Navigator the user gets notifications when following a route. The notifications panel presents a list of closest driving regulations and their remoteness. The program starts the countdown as the vehicle is approaching the closest camera, hazardous area or service point. Navitel Navigator 9.10 contains an extensive list of traffic enforcement cameras (14 types), potentially risky zones (9 types) and service stations (7 types). In case the driver chooses to attach a smartphone or tablet in a vertical position, all the notifications will be displayed in the left part of the screen, right below the navigation bar. Once rotating the device horizontally, the notification widget slides to the right side of the screen. 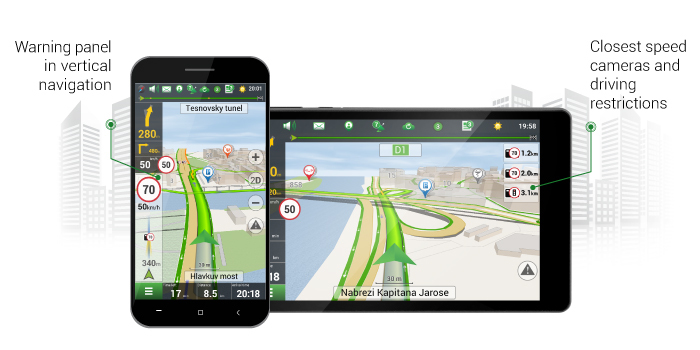 The software update includes a prominent notification system that will increase road safety. The driver will get timely notifications about speed regulations, locations of service points and high-risk road sections (such as zebra crosswalks, dangerous speed limit change, risky road bend etc.). 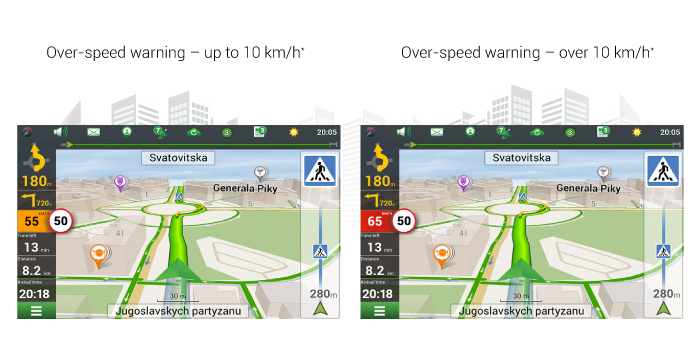 In the new version of Navitel Navigator speed limit is displayed within a red circle, on the right side of the current car speed. If the car is exceeding the authorised speed, the program will notify the driver in case of any traffic violations – orange colour block for up to 10 km/h overspeeding, the red one for over 10 km/h overspeeding*. Optimized interface for devices with 2:1 ratio. Android users can get the latest 9.10 update from the DOWNLOADS page on the official NAVITEL® website or via Google Play. New users can get a full function 7-day trial version. When the trial period expires, the program will switch to limited functionality mode. In order to use the premium version you must buy a license key. You can also purchase a 1 Year Subscription to the chosen maps and enjoy the advantages of the premium version with full functionality for the whole year**. You decide if you want to renew the subscription after a 1-year time period or cancel it. Navigate the world on your own terms! 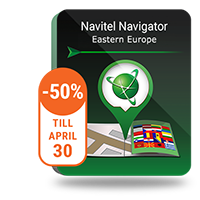 **Subscription is available for all existing navigation map packages, except for maps of Russia, Ukraine, Belarus, and Kazakhstan, or any packages containing at least one map of these countries.